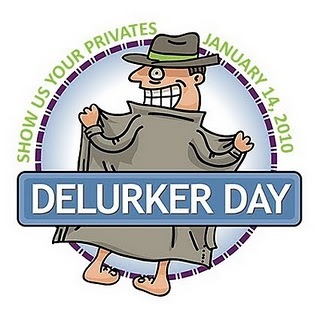 I just learned from The Motherboard that today is National Delurker Day. And, as we all know, I am all about holiday celebrations. And blindly following those around me. To honor this grandest of holidays, we're supposed to delurk by leaving a comment. Now, I'm looking right at all 5 of my readers.....I expect a comment out of each and every one of you. You can tell me how wonderful I am or how beautiful my children are or your favorite books or why you think I'm a total loony tune or your New Years Resolutions. Anonymous or not. Whatever. I'm not picky. My 5 year old loves doing this whenever she's asking for something and the first answer is "not yet". It's fun. Really. IWhile I read your posts, I don't always comment (mainly because can'y find anything witty to say) so does this count as de-lurking? You're totally wonderful and you do have beautiful children. And my favorite book, well, there are too many, and I'm glad you're a total loony tune because I am, too, and I think you already read about my resolutions so I won't post them all here. Happy delurking day! You're beautiful, and your children are wonderful (or is that the other way around?). Either way it's true!! Favorite book? Too many books, too little time!! I never lurk! Your blog is EXTREMELY comment worthy!! 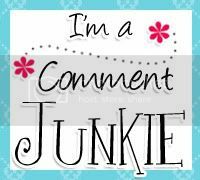 I lurk - just not regularly! (hence the late comment on your blog). I haven't been able to be around as much as I would like lately so it may seem like I'm delurking but I'm not.